Field Marshal Sam Manekshaw was the Chief of the Indian. Army from 1969 to 1973. This book is a reflection on Sam, his character traits, sense of Humour, moral and professional courage and the enigma that made up his personality. It presents a unique insight to his thinking and his style of dealing with a spectrum of situations from the sublime to the mundane. Above all, it portrays his humility, his honesty and his respect for men in uniform, regardless of rank. The book is anecdotal and an easy read as it walks you through his life from childhood to the pinnacle of glory. The political canvas, woven lightly into this very personal story, highlights how a brilliant military strategist shaped the destiny of theIndian subcontinent. Family photographs, copies of citations, handwritten notes and personal correspondence make this book a treasure to read and acquire. Brigadier Behram Panthaki, ably assisted by his wife, Zenobia, has written this excellent book on Field Marshal S.H.F.J. Manekshaw, popularly known as Sam, who led the Indian Army to a historic and unprecedented victory in 1971. This book is not a biography; it is primarily a personal account by the author of his close association with the field marshal and his family while serving as his ADC. It admirably portrays, through various anecdotes, the character and personality of a great military leader gifted with tremendous wit tremendous wit and sense of humour. I had the privilege of working with Sam for over two decades and saw him grow from a promising young lieutenant colonel to a field marshal. He did great credit to each appointment he held during his long, illustrious career. For the first ten years out association was friendly and cordial, but for the next decade it came under a cloud due to circumstances beyond my control. However, I did get an opportunity to serve under Sam again and clear the misunderstandings. Sam was more than generous to me. In 1960 I was appointed staff officer to Lieutenant General B.M. Kaul who at the time was quarter – master general. Because of his close relations with Prime Minister Jawaharlal Nehru and Defence Minister Krishna Menon, Kaul had become all powerful in the army. Both Menon and kaul were hostile to Sam for their own reasons. Menon, because sam had refused to be disloyal to the then army chief, General Thimayya, with whom Menon had differences. Kaul was envious of sum who was junior to him but far ahead of him professionally and presented a threat to his aspirations to become the army chief. As his staff officer, I served Kaul loyally, and he rewarded me by nominating me to attend the coveted Joint Services Staff College in the UK for which only one vacancy was available each year and had to be shared among the three services. The army got its turn for this course once every three years. Normally officers in the rank of colonel of even brigadier were sent on this course whereas I was just a major. Since I had attended the Indian Army's staff course ten years earlier, Kaul suggested I go to the Defence Services Staff College (DSSC) in Wellington (south India) and complete a two – week attachment with the naval and air force wings before proceeding to the UK. Sam was a major general and the commandant of the college. Since Kaul and Sam were not on good terms I was seen as Kaul's man, sent to spy on the commandant. I arrived at the college to find Sam unlike his usual self, cold towards me and guarded in his speech. While on attachment, late one night I received a message to immediately meet a colonel who had been sent by Kaul from Delhi and was staying at a hotel in Coonoor. When I entered the colonel's room I found two army instructors from the Staff College briefing the colonel and insinuating that Sam had been indulging in anti-national activities. He had painting of Robert Clive and Warren Hastings retrieved from storage, restored and hung on the walls in his office. They alleged that during a lecture at the Shivaji Hall, in the presence of foreign students, Sam said that the painting of Shivaji riding a stallion was misleading, for Shivaji only rode tattoos (ponies). The colonel asked me to give similar evidence but I Refused since I had not witnessed any anti-national activity by Sam. The colonel was outraged and threatened to call General Kaul. He dialled Delhi several times but never got through. I walked out of the hotel, relieved but disgusted with the sordid affair. I could not, obviously, apprise Sam of what I had witnessed as I may have been seen as one who carried tables. On my return to Delhi, kaul sent for me. He was very angry at my refusal to give evidence and threatened to take me off the course in the UK. I was brusquely told to leave his office, which I did with some relief. I received no further communication from him and after three days I sailed for England, as scheduled. While in the UK, I heard that a court of inquiry had been held against Sam and he had been exonerated of all charges levelled against him. On completing my course I was promoted to lieutenant colonel and posted as instructor at the Defence Services Staff College in Wellington. Sam was still the commandant and continued to be distant with me. Meanwhile Kaul had taken over command of the newly raised 4 Corps along the north – eastern border with China. A few weeks later the 1962 debacle took place when the Chinese walked in and handed us a humiliating defeat. Kaul was removed from command and sam was promoted to relieve him. This was divine justice. Sam continued to rise in the army. When he was eastern army commander, I served under him first as a battalion commander in 1965 and then as a brigade commander in 1968, in 1969 he became the army chief and in 1970 I was posted to the newly created Pay Cell in Army Headquarters to submit the army's case to the Third Pay Commission. Indian commissioned officers (ICOs), beginning with the first course which had graduated from the Indian Military Academy in 1934, has suffered a big pay cut in 1947. Sam's monthly salary as brigadier was one thousand rupees less than the salary of brigadier from Sandhurst commissioned a year before him. During the first two Pay Commissions the army had been represented by the Defence Ministry and thereby denied an opportunity to make a strong case for redress. 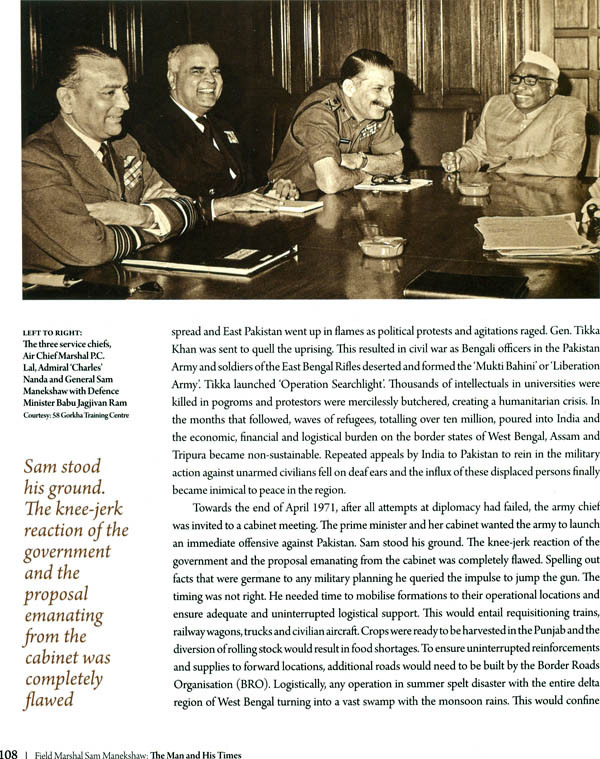 When Sam became chief he convinced the government to allow the army to present its case directly to the Third Pay Commission. His retirement was fast approaching and a pay hike for the army would be his parting gift to the service. At that time I did not know the great importance he attached to the task assigned to me and felt that my new posting was not a high profile appointment and spelt the end of my professional career. Is spite of feeling sorely disappointed I worked hard and produced a 300 page report for the Pay Commission. Sam was very appreciative of the depth and quality of my work and asked me to make presentations to the army commanders and the chiefs of the other two services. It was by sheer quirk of destiny that I was appointed Aide – de – Camp (ADC) to Lt Gen. Sam manekshaw. While graduating from the Indian Military Academy (IMA), Dehradun, I had opted for the 8th Gorkha Rifles but ten days before the Passing out Parade, I learnt that I had been assigned to the Corps of Signals. My morale was is my boots. My company commander, Maj. Ratan Singh Yadava (Army Ordnance Corps) seeing my disappointment circumvented Procedures and arranged for me to speak to Lt Gen. Sam Manekshaw, from the 8th Gorkha Rifles, who was western army commander based in Simla (now Shimla). Desperation trumped protocol and throwing caution to the wind, on a 'strength I' military trunk line, I pleaded my case. Indiscretion being the lesser part of valour, I threatened to resign if I did not get my choice of arm which I was entitled to since I had stood sixth on the merit list. I learnt much later that my call had interrupted the general at lunch. After bearing me out he returned to the table and told his family about the strange call he had received from a gentleman cadet 'Beroze' Panthaki at the IMA who wanted to join his regiment. Thanks to the poor connectivity 'Beroze' was what he called me ever after. My request was categorised as a tall order and my threat to quit had only amused him. Luckily for me his daughter, Sherry, prevailed on him to do something for the poor bloke' who had mustered the courage to speak to an army commander. He did something indeed for within forty eight hours I was transformed into the lucky bloke. An amendment signal was received at the IMA and I was reassigned to the 8th Gorkha Rifles. On February 9, 1964 I earned my commission as a second lieutenant in the Indian Army and was posted to 58 Gorkha Training Centre' (GTC) in Dehradun. In three short months I tired of the mundane duties at a training establishment and wrote to the general, seeking a challenging assignment in an active formation. This time round tile 'old man" was convinced that I spelt trouble and needed to be 'fixed: For a second time he did intercede on my behalf, and within ten days I received my posting order to the 2nd Battalion of the 8th Gorkha Rifles (2/8 GR) which was engaged in counter – insurgency operation in Nagaland. I joined the unit in June. My Commanding Officer (CO) the late Lt Col. Shamsher Singh, was from the old school and believed that subalterns were meant to be seen, not heard. I settled into the routine of an infantry battalion and saw combat action; my dreams finally realise. In December Lt Gen Sam Manekshaw, who had taken over as eastern army commander, visited the battalion while we were on training in the plains of Assam. Officer and JCOs lined up at Jorhat airport to receive the new army commander. Being the Junior-most, I was last in the receiving line. When he approached me I saluted and said, 2nd Lt Panthaki Sri! 'So you are the bugger? Yes Sir, I replied! That was the sum total of our first encounter. Six mounts later, in June 1965, I was summoned to the Cos office one afternoon ordered to pack my bags and take the air force courier to Calcutta (Now Kolkata) the following day. The army commander had asked for me as his ADC. I had no choice as a subaltern. I returned to my basha, packed my worldly possessions in one small trunk and a kitbag and collected my movement order. The next morning I boarded at the courier to Calcutta. In a starched cotton uniform Sam Browne and a Gorkha hat, I reported at the army commander's office. I was ushered into the large room with Spartan furnishing. I clicked my heels, saluted and stood at attention for what seemed like an eternity. There was no response and the general remained engrossed in his work. On the floor lay sprawled an Alstian, a Labrador and a Cocker Spaniel who snored in cadence, and like their master ignored my presence. Finally, the general looked up from his papers and sternly asked, will you work for me? Before I could respond, I was told to get out and get my instructions from his Assistant Military Secretary (AMS). As I turned on my heels and left his office I thought I was in for a rough ride. The AMS Lt Col. Rustom Khambatta was made of sterner stuff. I was given a detailed briefing on my role and responsibilities, on dos and don'ts and on the general's likes and dislikes, his quirks and idiosyncrasies. With that I was sent packing to my and given a stack of files to go through. Mid morning the army commander walked into my room, gave me the once over and asked me why I had come to work for him dressed like a Christmas tree, referring to the Sam Browne that is worn only on formal occasion! I replied that I was following my Cos orders. He turned and left without a word, leaving me uneasy and diffident. I served as ADC to Gen. Manekshaw for two years while he was the eastern army commander leaving him to join my battalion in NEFA in 1967. In August 1969 I returned as his aide when be became army chief, leaving him briefly to join my battalion during the 1971 war with Pakistan. I continued to serve on his staff till he relinquished office on January 15, 1973 after he was promoted to Field Marshal. In sum, I worked for him for a longer period of time than any officer of the Indian Army and I was fortunate to have had the opportunity to serve a military strategist who changed the map of the Indian subcontinent. Field Marshal Sam Manekshaw was an iconic leader that a nation produces but once in many generations. A lot has been written about his military prowess. The purpose of this book is to shed light on his character and on his qualities of head and heart. All of what I recount is through memory for when I served with him, I never thought that I would one day attempt to put pen to paper. The recollections are mostly mine; the writing is my wife's. This book is a portrait of a man who rose to the highest rank in the Indian Army without compromising his core values of honesty, integrity and moral and professional courage. We hope this book will inspire young Indians and reaffirm that humility and integrity are not mutually exclusive. Our sincere thanks to the Manekshaw family for sharing personal photographs, letters and anecdotes to Lt Gen. S.K Sinha for his guidance and for writing the Foreword to this book, to Lt Gen S.K. Sinha, ex – Vice Chief of Army Staff and Colonel of 8th Gorkha Rifles for his Support, retired officers who served under Sam and readily shared their experiences with us to our publisher, Niyogi Books India, and to family coursemates and colleagues who encouraged us to write.